Samuel L. Jackson and Bruce Willis reprise their “Unbreakable” roles Elijah Price also known as Mr. Glass and David Dunn. Joining them from “Split” is James McAvoy as Kevin Crumb and the multiple identities who reside within him. Also Anya Taylor-Joy joins “Glass” as Casey Cook who was the only person to survive an encounter with The Beast. I am not sure what I expected, but this movie was just plain crazy. It’s almost like a deconstruction of a series of events that have happened in the lives of the three men, Dunn, Price and Crumb. There are times of clarity and then there are times of confusion. There are a few interesting scenes and some interesting action and intrigue, but unfortunately that’s not enough to make “Glass” a good solid movie. 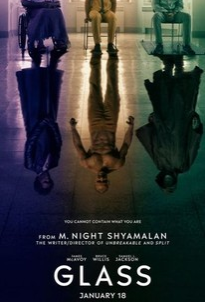 “Glass” is not the worst movie I have ever seen, but it certainly is not the best.